Log In Log in or register now for our services shown below! You know how important this is. We are proud to have access to a detailed weather forecast that can help you manage your week. 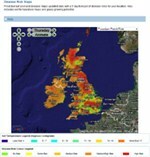 Predictive turf pest and disease maps updated daily with a 6 day forecast of disease risks for your location. Also soil temperature maps and grass growing potential. View historic charts of our weather & disease predictions for your location.